The GMC Sierra is a fancypants version of the Chevy Silverado. 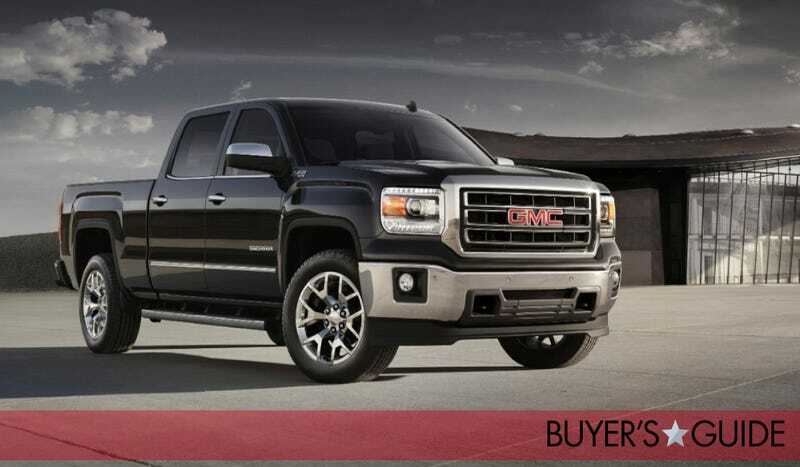 What do you need to know before you buy a GMC Sierra? Don’t worry, we’ll tell you everything right here in our Buyer’s Guide. The Chevrolet Silverado is a good, solid truck. But if you’re one of those guys who likes to drink his Earl Grey with his pinky finger up, you might dig the GMC Sierra’s more luxurious options and more chizzled good looks. It’s everything you love about the Chevy Silverado with nicer interior appointments, a more stately face, and markups on every option. Great looking truck and a genuine pleasure to drive, but you gotta pay to play. The GMC Sierra doesn’t offer any practical advantage over its Chevy equivalent, which makes it a tough case on a budget. The 2016 model year brings significant styling changes to the GMC Sierra. The truck gets all new front and rear bumpers, a new grille, and new lights all the way around. Changes to the interior are miniscule. There’s new iPhone integration in the infotainment system, but that’s about it. If you’re looking for a fancier, handsomer Chevy Silverado, we’d recommend that you either wait for the update and see what you think of the styling in person, or see if you can score a great deal on the current model, which is still pretty attractive.